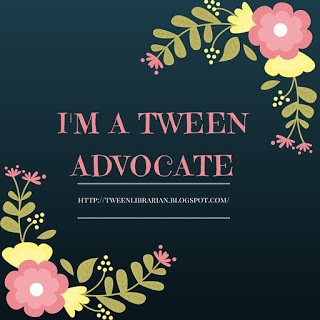 Tween Tuesday is a weekly meme to highlight great reads for tweens (and sometimes giveaways!) Join the fun and leave your link below. It's a known fact that if you work with tweens, you're going to be asked "I want books like Diary of a Wimpy Kid." When that happens, give them Dork Diaries by Rachel Renee Russell. The Dork Diaries books have a great sense of humor and Nikki gives us a great girl perspective into middle school. Nikki's at a new school and she feels like a dork. But really Nikki is a funny, creative, artist who lets readers peek into her diary and read her observations about middle school. 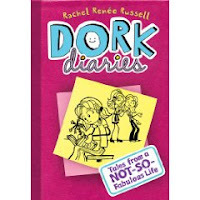 Want to win a Dork Diaries prize pack? I've got copies of Dork Diaries 1 and 2 (thanks to the author) and a Slumber Party Cube from Table Topics (donted by Table Topics). To Enter: Leave a comment and answer this fun Slumber Party question: If you could only eat one dessert for the rest of your life what would you choose? Most definitely ice cream, preferably mint chocolate chip. I'd go with ice cream, too, but propbably hot fudge sundaes. Brownies. Lots and lots of brownies. Especially the ones with frosting on top...yum! Oooh...that's a toughie. I recently had a dessert called a pizookie while I was out west. It's a mostly baked cookie with icecream on top. I think I'd have to go with that. Yum. Hmmm--I think I'd have to go with hot fudge sundaes too! I would have to go with ice cream, but really how can one choose?! Carrot cake! Best dessert ever! Cheesecake, I love any kind of cheesecake. Definitely french vanilla bean ice cream. My teen intern says "Chocolate chip cookies!" I would have to go with lemon squares. Thanks! I really should spell check before I publish! Mississippi Mud cake....or anything dark chocolate!!! These comments are making me hungry! mmmm, i would choose ice cream cake, hands down :) That book looks adorable<3. The desert I would chose would be cookies and my daughter says "ice cream" for sure! Without a doubt it would be Ben and Jerry's Pumpkin Cheesecake Icecream. Ok... I am not really a dessert person. But I could spend a lifetime eating chips and homemade salsa! Without hesitation...Chocolate Chip Pie! (must be warm before eating) Delicious! Thin Mint Girl Scout cookies...an endless supply.